You do not need an extra hour in the day to get to all of your errands. 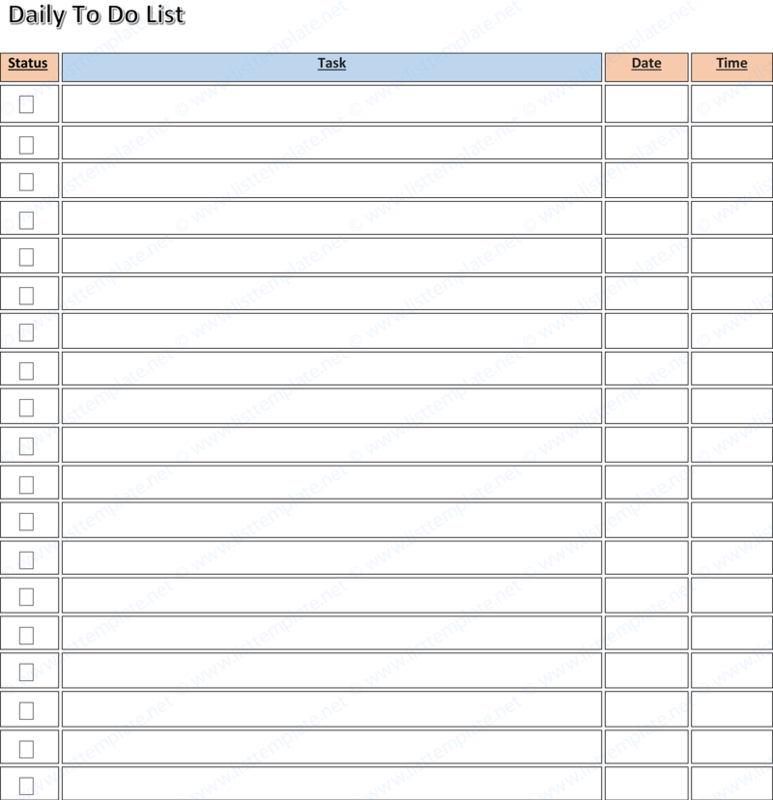 All you need is a daily to do list template that schedules your activity. A daily to-do list keeps you on track. For example, if you are a parent, a worker and a student, you have to schedule time to play all of those roles. A daily to-do list helps you keep track of your tasks. This way you will not forget about a task or do a task again because you forgot you did it. Daily to do lists can help you make big projects into small daily tasks. For instance, you want to clean out your closet. On Monday, your to-do list can have a task that deals with your shoes. Tuesday, you change all of your hangers to the slim no-slip kind. By the end of the week, your closet is how you want it, and you are not overwhelmed or exhausted from tackling the task all in one day. Daily to-do lists can be for your chores, errands, work tasks, homework, etc. Everyone needs a to-do list to keep track of their life. Here are three daily to do list to keep you moving. This daily to do list template lets you record the status of your tasks. You can decide how you want to do this. You can put a check for completed work. You can put a circle that is filled in. For work that is half way there, you can put a circle that is half filled. The template is simply designed. The status of your task is the first column. The description of your task is the second column. You can get as detailed as you need to be. For example, if you are doing homework, you can copy the homework assignment in this box. This way you do not have to look it up when you start it. It is on your to-do list. The next column is the date. It is followed by the time. This template is great for outlining your day. Some tasks take priority over others. If something unexpected comes up, you can switch tasks to another day. However, some tasks are time sensitive and have to be done as soon as possible. This to-do list starts with a priority column. For example, your main priority for the day is to meet with your accountant at 2 PM. You may decide to move your 1 PM task, because there is a traffic jam that will make you late for your appointment. This to-do list is great for homework, work tasks and bill errands. It has columns for due dates and due times. If your credit card payment is due on the 7th of every month and has to be paid by 8 PM eastern time, this to-do list can help you keep track of that. The status column helps you label your progress. 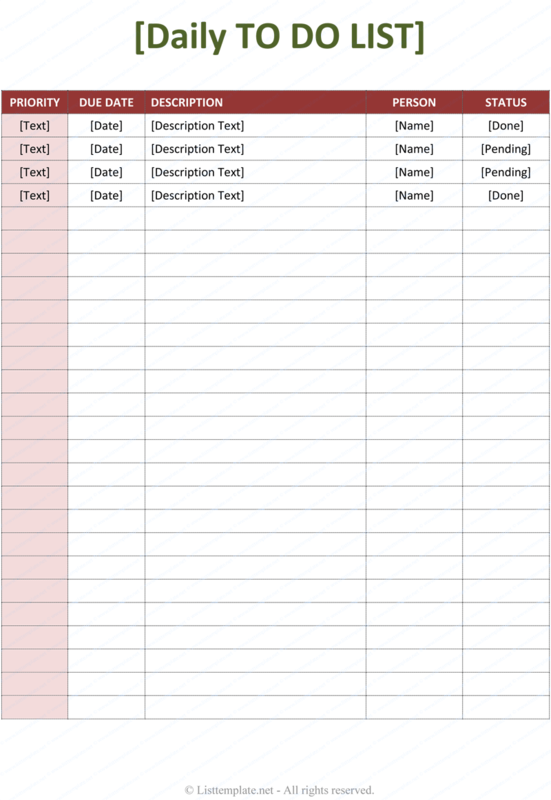 This to-do list has a priority column, due date column, description and status column. It also has a person column. This is great for making appointments. You can list the person you are going to see or call. If one of your tasks is to call the cable company, you can also put the number in the person column.